It's a nave domestic Burgundy without any breeding, but I think you'll be amused by its presumption. 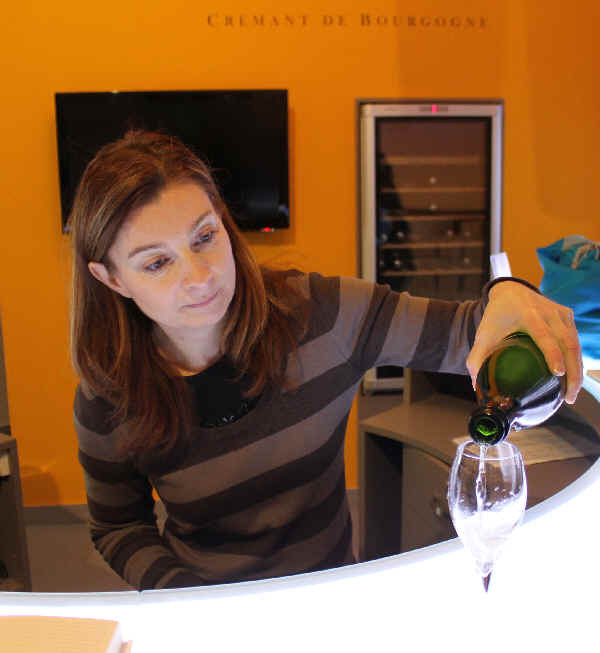 Some people seem surprised when we tell them we spend a lot of time and effort to taste, evaluate and select the wines we bring in to the shop. Apparently the surprise comes because most wine businesses don't bother, relying on mysterious numerical scores or, apparently, a dart board to make their selections. We look for connoisseur-quality wines at everyday prices. You'll find good value! The Bourgeois family offer this outstanding Sauvignon from vineyards in the Central Loire Valley of France. It's crisp, zesty, lemony....think of it as a scaled down version of Sancerre. Garnacha Tintorera is the main grape, along with Monastrell. The resulting wine is dark in color, nicely berryish and remarkably full, yet supple. Don't miss this. A blend of Loureiro and Alvarinho, this is a fresh, crisp, faintly spritzy dry white that's ideal as an aperitif, but it also pairs well with seafood...fried calamari, grilled prawns, etc. Colombard and Gros Manseng in this new bottling from Michel Duffour & family...no oak to the crisp and light dry white. Hints of citrus...This is a brilliant wine and one of the best Cotes de Gascogne on the market. If you enjoy non-wooded New Zealand Sauvignons, for example, or fresh Pinot Grigio, do consider this. It's a thoroughly delicious bottle which tastes great and nobody guesses it to be $8.99. 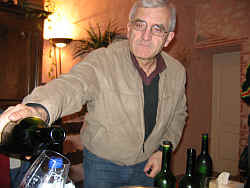 Winemaker Michel Duffour...a Gascogne Meister! 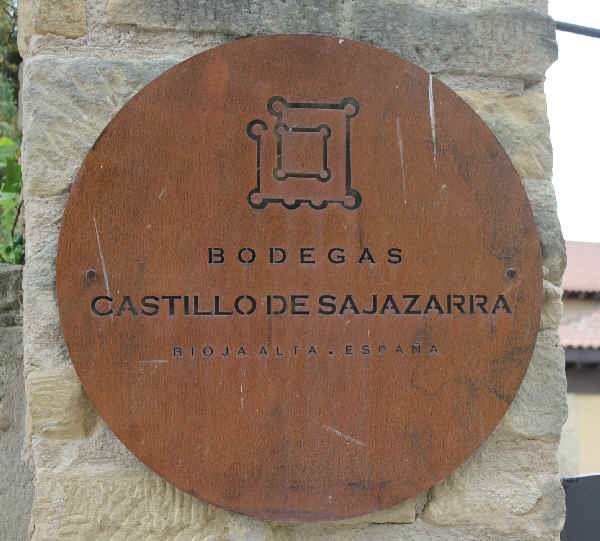 It's a blend of three varieties: Aragonez, Trincadeira and Castel�o. Medium bodied. No oak. Mild dark fruit notes. Fairly smooth and dry. When we looked to replace a California brand that had been swallowed up by a big drinks company, we tasted a few candidates. One had greater pedigree and would be easier to sell based on its label and the perceived value of its more prestigious appellation, but we chose this because it is the higher quality wine. Mildly citrusy with good varietal character. This comes from vineyards in Emilia-Romagna and the vineyards are pushed for quantity, producing a well-priced, light Sangiovese that's the definition of a "Spaghetti Red." And from Emilia-Romagna, you'd have a Bolognese sauce on that pasta. The Wine Enthusiast publication listed this as costing $15 (and they gave it a nice review)...not sure where they shop for wine, but if you come to Weimax, this is a mere six bucks. It's a medium-full bodied red with dark fruit notes and no oak. Douro Valley red for this price is a remarkable value. Gee, we've been offering this French white for more than two decades. It's routinely good, non-oaked dry white and showcases the appley character of Pinot Blanc. You can buy some more prestigious labels from famous winemakers, but you won't be getting a hugely more profound wine despite those costing two+ times the price of this. We have a few customers who buy this by the case, saving 10% or 15%. Smart people. LE LOUP DANS LA BERGERIE French Red $10.99 From the Orliac family in France's Languedoc, this is a delightful blend of Grenache, Syrah and Merlot. It resembles many good Southern Rhone reds but the price is a bit more reasonable than you'll generally find. From Germany's Mosel region comes this nice little entry-level Riesling. Dr. Ernst Loosen makes many fancy wines and they cost a lot more, so this is his idea to encourage people to discover Riesling and then "trade up." The label depicts four old codgers sitting on a bench. They're likely discussing the results of last nights calcio (soccer) match, the latest skuttlebutt regarding Italy's political leadership or, more likely, what they had for lunch earlier in the day. This comes from southwest Toscana and it's a cherryish, fruity Sangiovese that's young and intended for immediate drinking. That's a good thing, because those old boys on the label no longer put wine in the cellar to drink in another ten years. It's a medium-light bodied red, smooth and you. We've had this hot little number in the shop for perhaps 15 to 20 vintages. It's well-priced and it's fresh, dry and a good entry-level version of Melon de Bourgogne, the grape of the Muscadet appellation. We routinely show this to people who want something light and crisp but they typically misread the label. "Muscadet? I don't want anything sweet." they say, misreading it as Muscat. "No, it's dry. 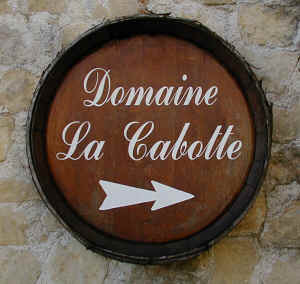 Muscadet is made of Melon de Bourgogne." "But I don't like Muscat. It's too sweet." "No, it's not made of Muscat. It's Muscadet from the Loire Valley in France!" "Yes, but I don't want anything that's fruity like Muscat." Here's "the Muscadet of the South" of France. The grape is called Picpoul or "lip stinger" in the local patois. It's a bone dry, crisp little white that never sees an oak barrel. There's a modest oyster industry not far from where these grapes are grown...a fortuitous dynamic as the wine pairs handsomely with shellfish. We had presumed it was importer Jorge Ordo�ez who used the term "Wrongo Dongo" with great regularity, but the legend has it that a Washington DC wine merchant routinely trotted out the phrase. Jorge, though, imports this lovely, juicy, medium-full bodied red from Spain's Jumilla region. These days the label is a bit cartoonish, but the wine remains dark in color and teeming with fruit. It's not complex, but it is pretty good. And given that you'll get change back from your ten dollar bill, this is a veritable bargain. Soave is not exactly the sort of wine that causes one to say "Wow!" The most famous wineries make perfectly "nice" wines but we've never been blown away to the point of excitement. We tasted this in Italy in April of 2017 and it was shockingly good. And now that's it's arrived here we're delighted to say it's still remarkably good. We've opened several bottles and ordered one in a restaurant where it was also damned good. The wine is made entirely of the Garganega grape. The Tamellini brothers don't water it down with Trebbiano. No oak. Intense peach and melon-like fruit. Far more aromatic and flavorful than a similarly-priced (or far more costly) Pinot Grigio. The fellow who owns this estate is the proprietor of another vineyard and he calls them both using the La Croix Calendreau name. Sure, go ahead and confuse the hell out of people. 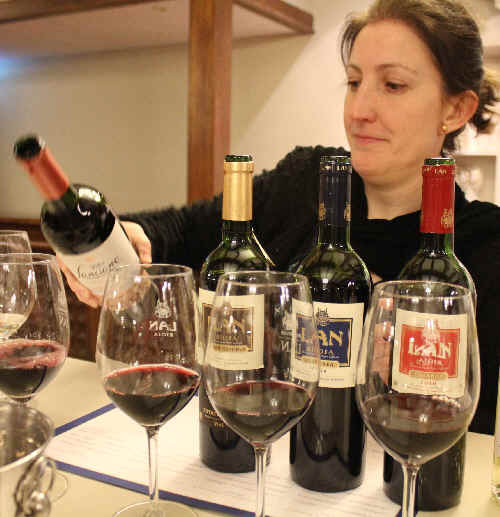 The expensive wine is made in the appellation of Saint Emilion. The more affordable bottling, this one, comes from a smallish estate just outside St. Emilion, so the wine carries the less-costly (typically) "Bordeaux" appellation. This one is designated as a Bordeaux Sup�rieur. That doesn't mean much, other than the wine must be a minimum of 10.5% alcohol (as opposed to 10% for basic Bordeaux), slightly older vines (is 10 years really that old?) and it must be matured slightly longer. Never mind these label intricacies, the thing is this is a nice, gentle, supple red wine made entirely of Merlot. It's not fancy, though some may be impressed by it's label, but it's nicely drinkable and doesn't require cellaring. This is not a wine out of the movies called The Hunger Games. District 7 refers to California's State Agriculture Department's regional categories of which Monterey is Dictrict 7. The Southern Rhone can be a treasure trove of good values. Lots of dark fruit notes to this medium+-bodied Grenache-based red. Once the site of a monastery, this delightful Chianti comes from a vineyard not too far from Pisa. Lots of cherryish Sangiovese to this medium-bodied, supple red. This wine displays more intense character of Sauvignon Blanc than many $25 bottles from Napa. That's because these guys treat the vines with more respect and still turn out a wine with a modest price tag. It's dry, citrusy and has lots of herbal Sauvignon character...too much for some people, in fact. Lots of classic, citrusy, grapefruity Kiwi Sauvignon in this "Best Buy" bottling. This has all sorts of fragrances and flavors typical of New Zealand Sauvignon except it's affordable. Sicily's Nero d'Avola is vinified in a light, snappy style without wood. Some Nero wines are made especially for the American market...oaky, a touch of sweetness, low acidity and no tannin. This wine is made to be drinkable in its youth, whether your American or Italian or Martian. The wine is along the lines of a Beaujolais. We chill this and put it on the dinner table in place of a Sangiovese. Pizza...sausages...lasagna, etc. 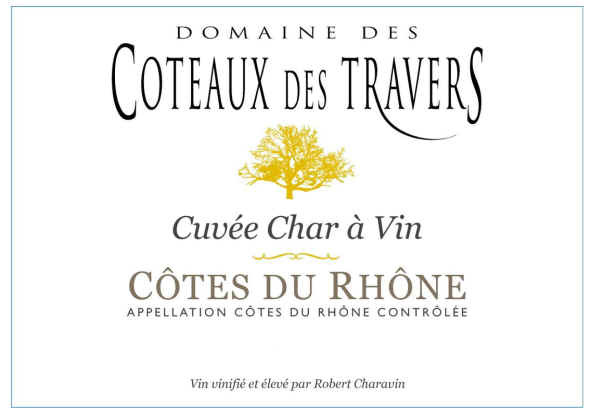 Most Southern Rh�ne whites are made primarily of Grenache Blanc, but this one has a fair bit of Viognier. It displays the peach and apricot notes of Viognier and is absolutely delicious. A few cases made their way to Burlingame as a result. We now have the "reserve" bottling of this remarkable Portuguese value-priced wine. Having sold the regular bottling for many years, we were skeptical as to whether or not this was the same wine with just a new label and slightly higher price. No, in fact, we found this to be a bit bigger and deeper and it's well worth the modest price increase. This is a beautifully fresh, mildly citrusy white Bordeaux...dry and crisp, it's primarily Sauvignon Blanc blended with a small amount of Muscadelle. Perfect seafood white! The Bidoli family makes wine near the famous Prosciutto town of San Daniele in Italy's Friuli. Winemaker Arrigo Bidoli is quite proficient in the cellar and he and his sister (Margherita) make wine for "wine drinkers," not collectors or wine geeks. 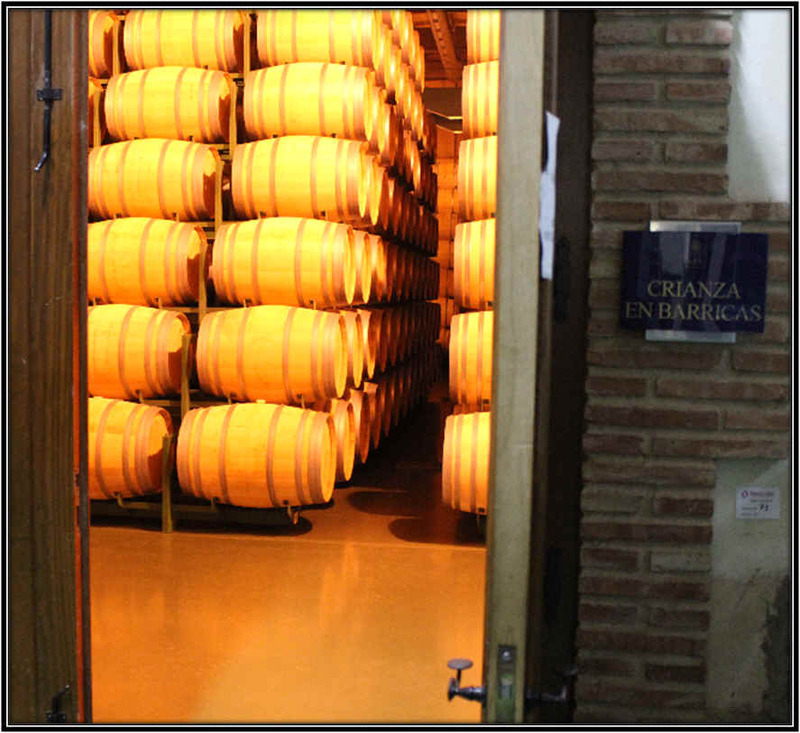 The label is called "Fornas" these days as they bought an old brick factory (a furnace) and converted it into a winery. Fresh notes of apples and pears on the nose and the wine is dry and zesty on the palate. Made entirely of the Jacqu�re grape, this comes from the French Alps and it's a full-flavored, non-oaked dry white...a great aperitif white and it partners handsomely with seafood. 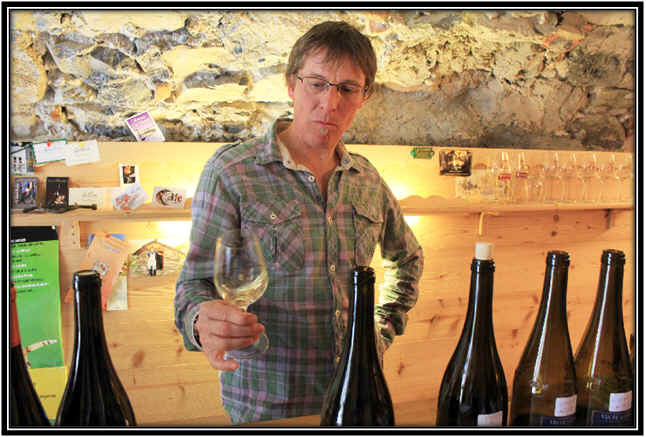 Winemaker Jean-Francois Qu�nard in his tasting room in the village of Chignin. 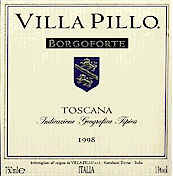 Most Tuscan Sangiovese wines which are blended with Cabernet cost a small fortune. This Super Tuscan has long been a favorite and for good reason. It tastes expensive! 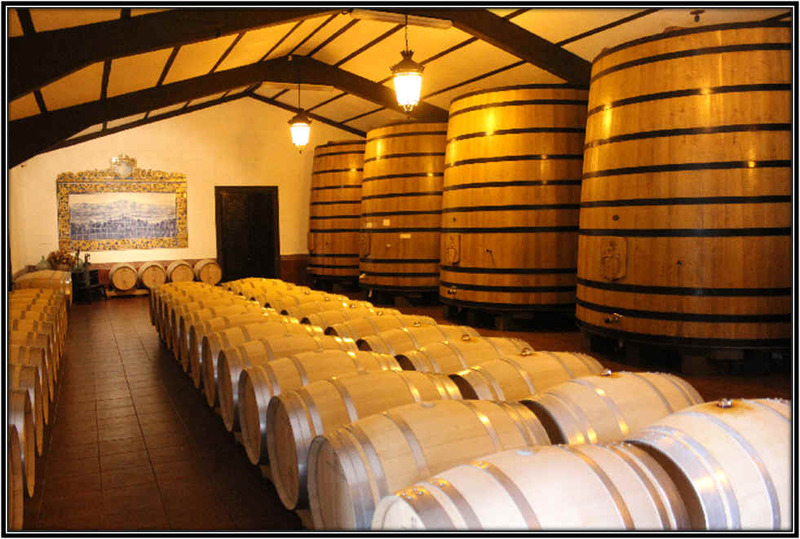 The cellar at Villa Pillo...a beautiful vineyard and lovely winery! From a smallish Chablis house, here's a crisp, tangy, non-oaked Chardonnay. Zesty & lemony. The 2015 arrived recently and it's delicious! Spain's Tempranillo grape shines brightly in the Rioja region...a touch of oak and nice red fruit. From Sonoma's Alexander Valley we have a really good Zinfandel-based blend (Geyserville area). Merlot, Zinfandel and Cabernet Franc...Sonoma fruit. Very amiable, as it should be. And they now have a Friends White Wine! It's a nice little blend of Sauvignon Blanc and Gewurztraminer to giving it some fragrance and spice. Dry. Nice. This a terrific Spanish red. There's a nice woodsy element here. We have had several vintages of Aalto, a remarkable Tempranillo from Spain's Ribera del Duero. Made from 40 to 100 year old vines and aged in a high percentage of new French and American oak barrels, this wine casts a shadow over many top Bordeaux and Napa Cabernets. If you liked the 2010 or 2011, this will surely please. Black fruits, cedar...it just needs a steak! One of the finest versions of the Alvarinho (Albari�o in Spain), Soalheiro's captures beautifully peachy notes with a mildly stony quality. It's a stellar bottle to pair with seafood. Made entirely of Tempranillo, this nicely oaked Rioja displays the classic notes of dill, cedar and vanilla bean in a medium-bodied red that's ready to drink. Their Ardanza (Sale $29.99) is from the 2008 vintage and is even more exceptional. I visited the winery a few months ago and the place is impressive. But the wines are impressive, too, and they arrive here at remarkably attractive prices. If you're looking for a special bottle that justifies its $100 price tag, here it is. The vines range in age from 20 years on the young side to 80 on the other...Granite soils...The vineyard was previously owned by Grippat and Vallouit, the former a legendary Syrah producer. A stylish Syrah with nice oak and fruit. We've described this as "Bordeaux meets The Rhone," as the nice oak here is certainly a feature of modern winemaking, but there's a nice element of Syrah and its inherent complexities. This wine normally retails for $135 and we're offering it at a near wholesale price simply to say "thanks" to our regular customers. From Germany's Nahe region, treat yourself to this when next visiting a Dim Sum parlor...off dry and yet so crisp and fine. Ask Kareasa. 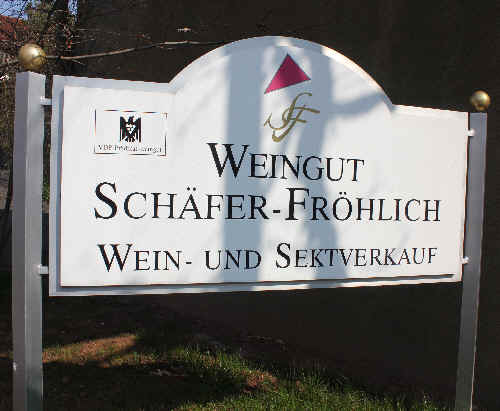 Tim Sch�fer was tabbed "Winemaker of the Year" by the Gaullt-Millau German Wine Guide in 2010. We're betting he'll be the first to win this award twice, as his wines are the epitome of finesse. 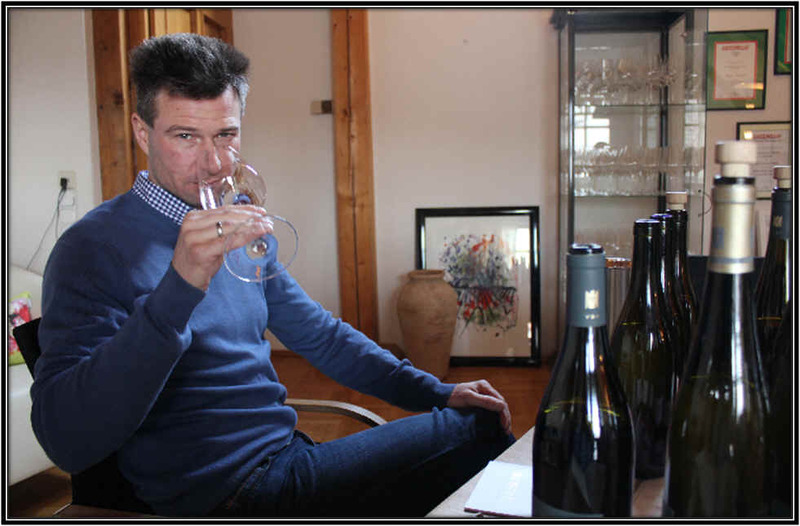 We love the snappy acidity of Sch�fer-Fr�lich wines. Wine critics sometimes describe a wine as "energetic." Taste one of these and you'll understand what they mean! It comes from Austria, not France's Champagne district, but my, oh my!, this is remarkable. It gives good Champagne a run for the money. I had tasted their bubbly some years ago...perfectly fine. Standard. Good, but not compelling. Pinot Noir and Chardonnay as the base, with bits & pieces of Gruner Veltliner, Pinot Blanc and Pinot Gris. More time on the spent yeast accounts for a marvelously toasty quality in the direction of Champagne, but with those other varieties you have a bit of a twist. It's complex and really good. 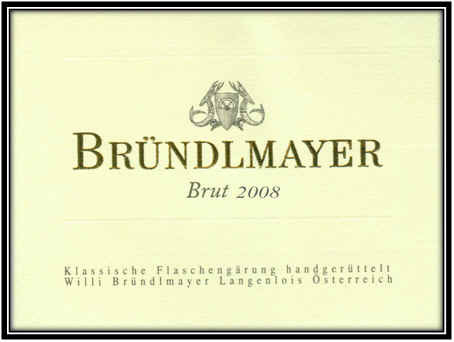 German wine authority Stuart Pigott is quoted as saying it's the best bubbly in the German-speaking wine world. This is a small estate which has very old vines...vineyards which were planted ages ago and, due to the very sandy soils, never had been hit by the root louse, phylloxera. The "young" vines on this property are 80 years old and the seniors are said to be 140 years of age! 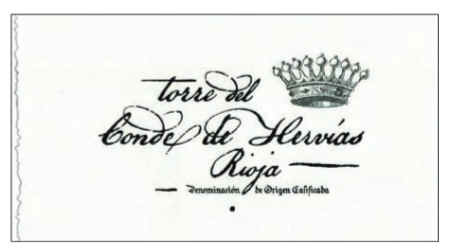 I tasted a few wines of this vintner and liked the Torre del Conde de Hervias, despite it being their "second" wine. I thought it tasted more like a good Spanish red and it was well-priced for the quality. It's remarkably intense and rather robust...aged in some new oak barrels. Some French oak and some American. It's 90% Tempranillo with 10% Graciano. Wow! 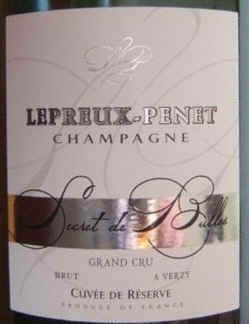 Made in Burgundy by a sparkling wine specialist, this, their top cuvee, offers a marvelously toasty, creamy character. That photo is of Agnes, whose name is on the family's top cuvee of bubbly. We've enjoyed this wine on a number of occasions, but tasting it alongside of bottles from Champagne, I've been surprised at how well this shows! With just a faintly pink color, this Pinot Noir-based bubbly outsells our California bubblies and Prosecco's. 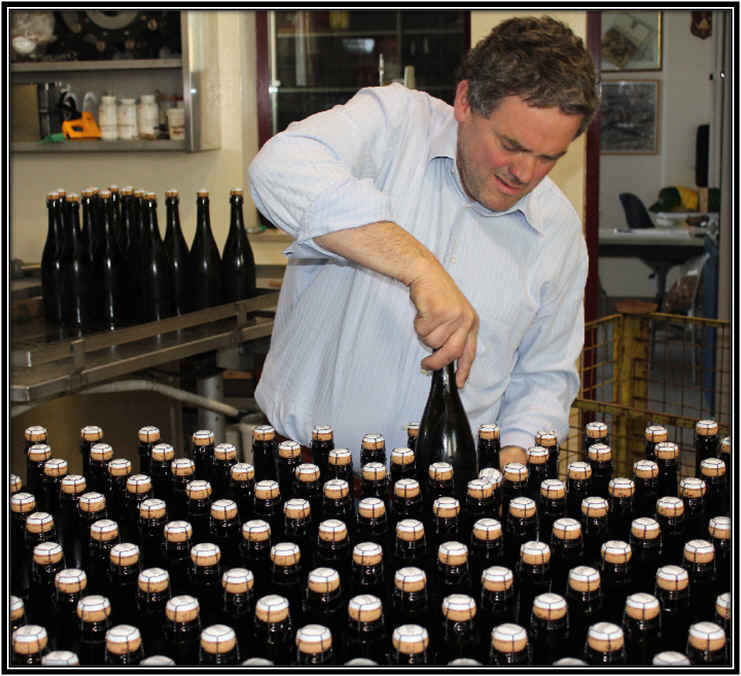 Monsieur Laugner is a fan of good Champagnes, so he's been making his own bottle-fermented, dry bubbly for many years. It remains reasonably priced and of good quality! Fresh, crisp, "white flowers" and dry. 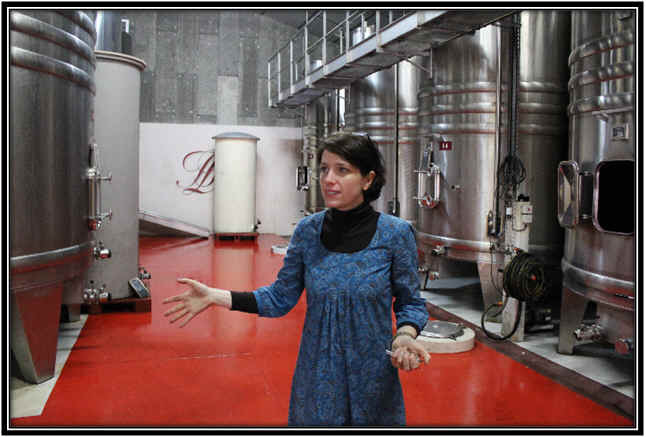 The Bronca sisters (le sorelle) grow good grapes on the hills near the winery in Colbertaldo. 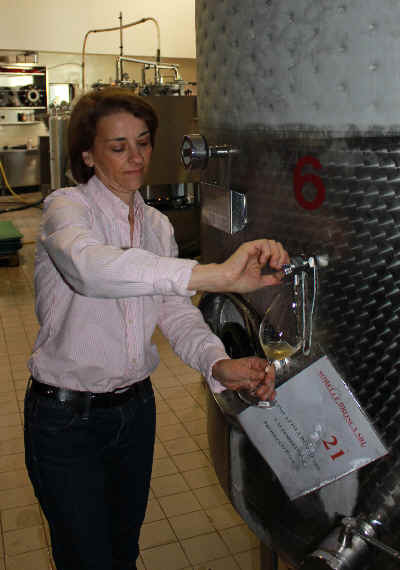 They process the fruit at harvest-time and keep it chilled and ready to vinify. 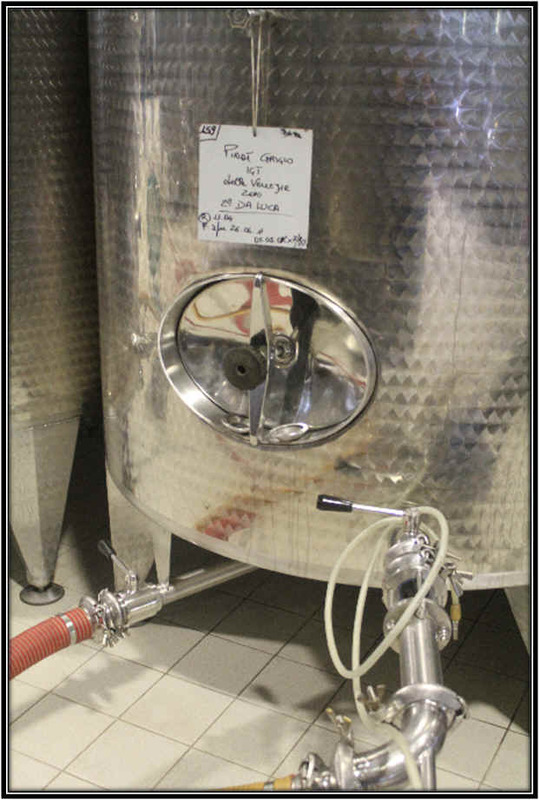 When our importer places his orders during the course of the year, the ferment the juice and turn it into bubbly. This explains why their wine is SO Good. It retains the fragrance of white flowers highlighted with pear-like fruit. Yes...they actually work in the vineyards and cellar!!! And they make really good Prosecco...lots of character and we sell their wines at a sale price. Antonella and her sister are also proponents of organic farming. Bottled without being filtered, this wine resembles good Vintage Port, but at a much more reasonable price. It is best decanted. It's a great match for Stilton cheese, chocolates or simply as a 'fireplace' wine. Smith Woodhouse is made by the British Port Mafia, the Symington Family. They also own a bunch of good brands, including Graham's, Warres, Dow's and the recently-acquired Cockburns.